Disclaimer: If you want to learn something then stop reading this post now …however if you (like me) take enjoyment in the weird, unusual and unexplained then please continue reading on. Regular readers of my ramblings will by now appreciate that I love VirtualBox and I’ve been using it for a considerable amount of time -long before those Oracle boys muscled in on Sun, and just recently I saw something that I found a little puzzling. Remember that flight simulator hidden away in MS Excel from over ten years back? I love seeing unusual behaviour displayed by applications and even more so when the behaviour looks like it has been put there for a reason. So what I have seen is not quite an Easter Egg but I would love to know the explanation of why, what is happening is happening. 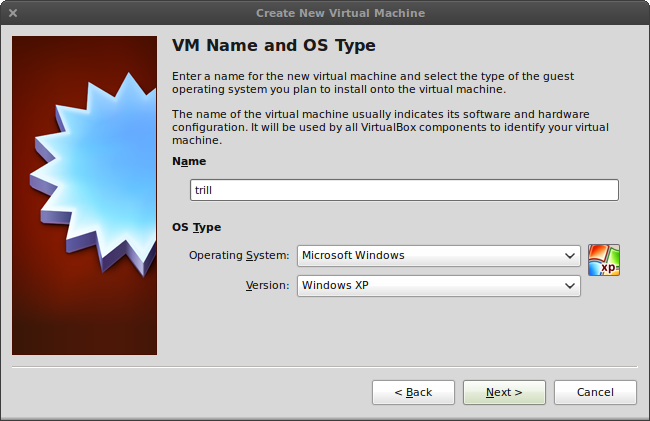 …so far I have typed “trill” for my VM machine with a view to typing “trillian“. Then as I enter the next “i” you will note the operating system changes to Linux! I am not quite sure the reason for this or if indeed “trilli” has any meaning or relationship to Linux (although Trillian does) but it tickled my fancy nether-the-less. There that’s it. I warned you that you wouldn’t learn anything from this post didn’t I?! This entry was posted in Linux, Virtualization. Bookmark the permalink.